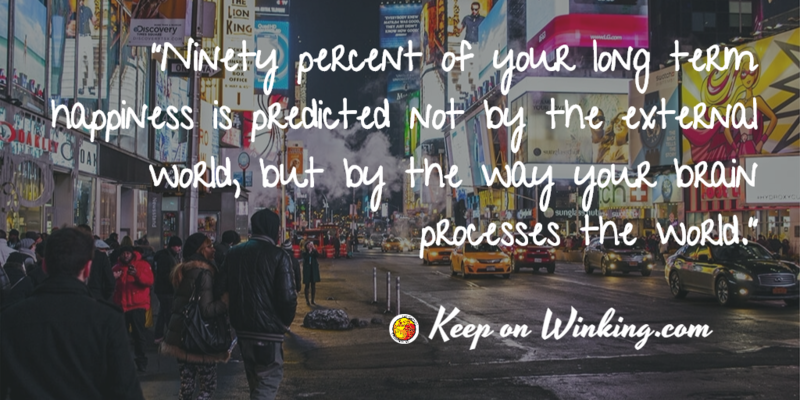 I find it strange to say that, because walking is something we do everyday to get us from Point A to Point B. Yet I find it is a an act of pleasure when I give in to the act as a mediation in motion that offers my senses a bit of enjoyment around every corner that surprises me. It is as if walking give me a more intimate knowledge of the city I am in, and Paris woos me, in more ways than one. 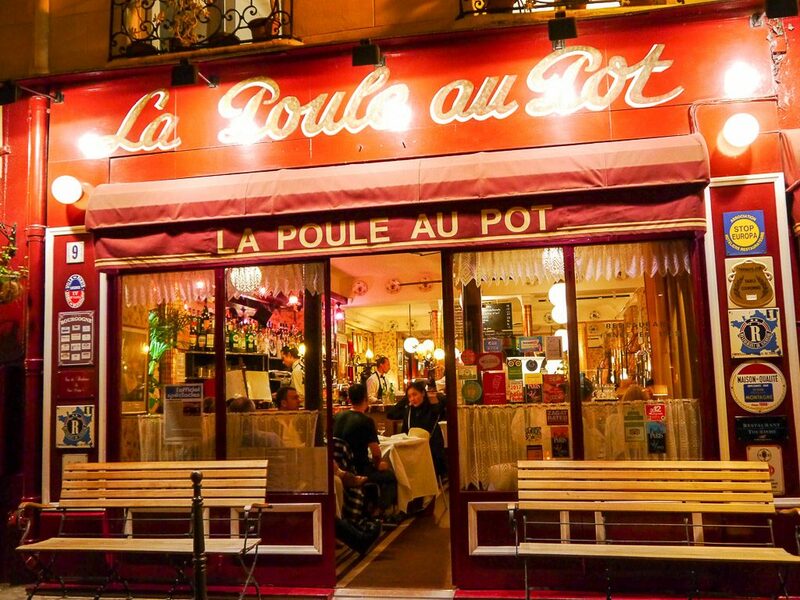 If you will allow it, Paris will entice you on a culinary journey… and like two lovers trying to maintain a long distance relationship, I can’t help but yearn for the memory of a good meal! Allow me to share with you the fantasy I had the chance to indulge in! I was seduced by the first sip of the house aperitif, a cherry liquor that was so nice I order a second because it pleased me. I tried my first Foie Gras here and was pleasantly surprised by the deconstructed salted jellied tomato, which reminded me of Bruschetta, to give it a nice balanced experience. It was difficult to chose a dish and in the end I decided on the chicken with the sauce, because Henry IV popularized eating a chicken every Sunday. The chicken was succulent and amazing, and I enjoyed my dinner. My traveling companion enjoyedthe Poule au Pot, prepared in the way Henry IV preferred it. The apple pie was a slight disappointment, but not through any fault of its own-I am rather obsessive about my sugar. As much as I like to try an apple dish in every country I visit, the French version, while well done, is too plain for my taste. I should have gone with the Creme Brulee or the ice cream, but I was curious. Sometimes it works for you and sometimes it doesn’t. Absolutely recommend for an authentic French bistro experience for couples, small families, and late diners. Meeting with friends new and old, La Coupole provides an ideal spot to catch up over a nice meal while taking in the Art Deco that adorns the pillars and the dome. 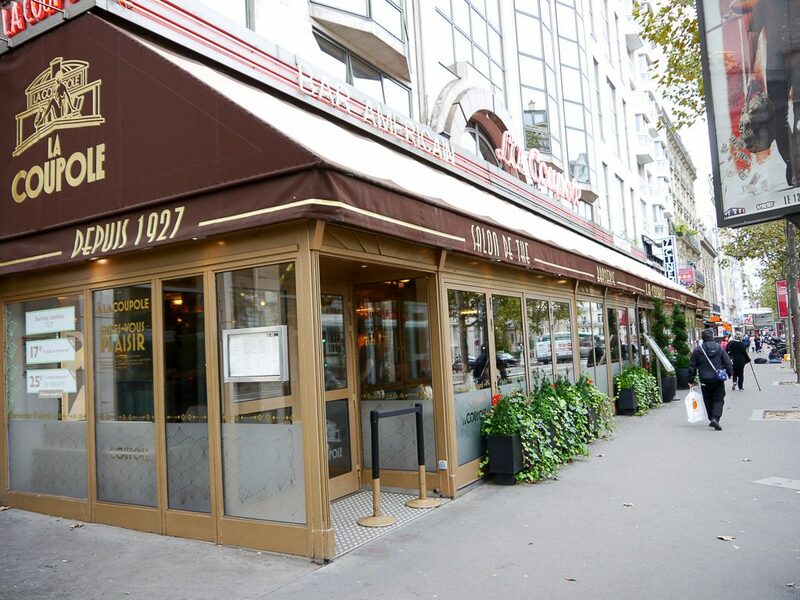 If you have a moment, take a look at the list of celebrities that frequented this restaurant. Some of the comments are quiet amusing! Walking around we checked out other potential places we could enjoy. 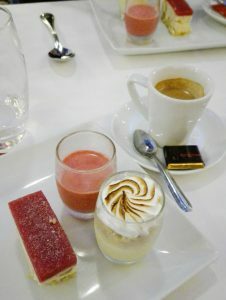 I don’t think you can find a bad meal in Montparnasse. There was a Korean place and several Breton creperies in the area, but this inviting display beckoned to us. The problem was I had never had a raw oyster before. Don’t worry, my curiosity eventually won me over and we found ourselves sitting down for another memorable meal. I didn’t want to order a platter of oysters before knowing if I would like them. So I made a strange request for a single oyster. 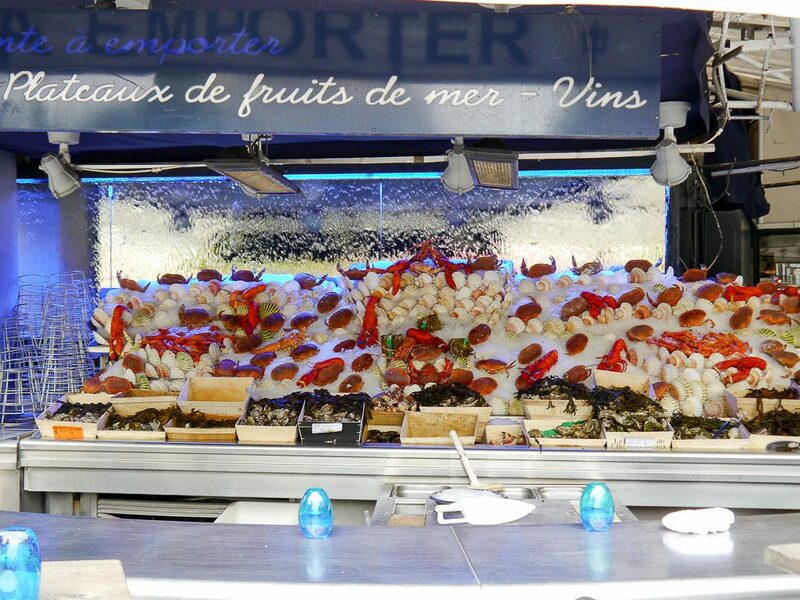 The place boast of having the largest variety of raw oysters to be found in Paris, and they have four restaurants in Paris, but I found this overwhelming to decide on one. Do you decide by looking at how pretty the shell is? Or where the oyster came from? I put my trust in the Maitre d’ and a beautiful oyster with a milky consistency of pudding was presented. My only regret is that I ordered this at the end of meal to try it… and I really should have dove in head first with a full platter! This meal leaves a sweet lingering in my heart and I know I will look forward to visiting again in the future! 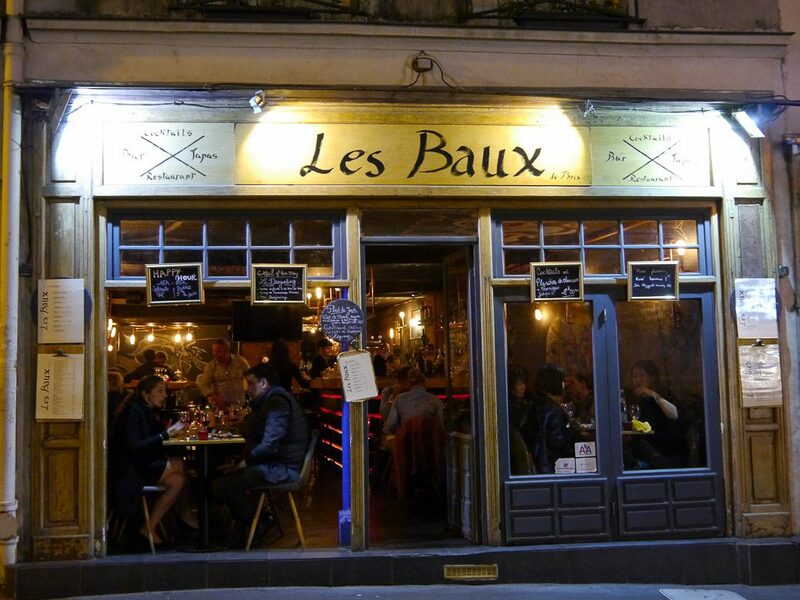 Our wandering ways brought us to the Les Baux in the Latin Quarter for tapas and a couple drinks. One of my favorite portions were the raw beef strips lightly seared with sesame and eaten with soy sauce. The place had a nice authentic vibe to it for the modern crowd. If you are looking for a nice neighborhood to stay, there was a nice looking Young & Happy Hostel across the way. I am told Rue Mouffetard is another great neighborhood to visit if you want to experience a street market! 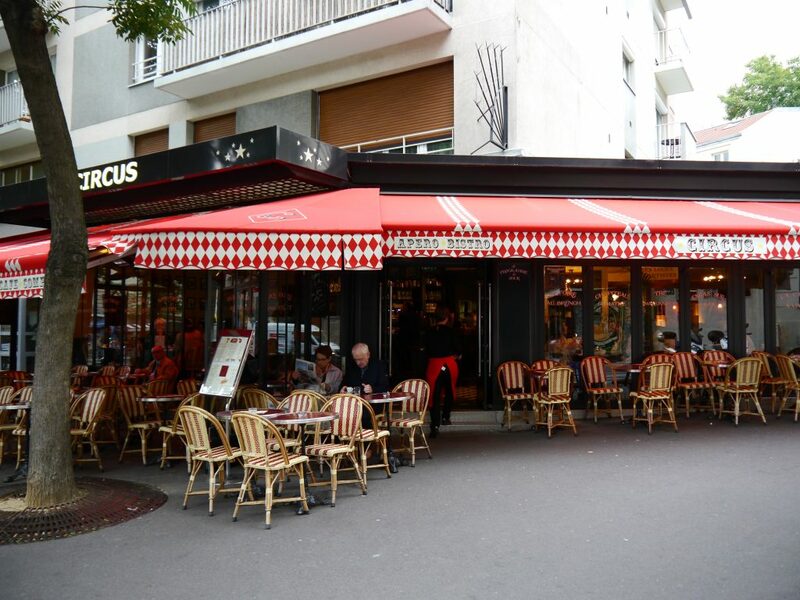 While exploring the 13th in search of an early breakfast on Sunday morning, we came across the Le Circus not far from the Place d’Italie. It was a stop initially out of necessity, but I loved it so much I came back the last morning I was in Paris to have the honor of the last croissant of the day. The atmosphere had a classic vibe in a more relaxed neighborhood, but the croissant and the pain au chocolat were mouth watering morsels of perfection. I savored every bite and I profess it now carries a special place in my heart. Hoping to take home a few to share with the family, I made a short study of the area and was unable to determine where these were coming from. Alas, fate has decided that it must be my own personal little secret to keep. Food, like walking, is as boring or exciting as we make it. However we choose to mark the way we spend our day, I hope you find something that delights your palate. It might be something new or maybe an old favorite revisited. Whether you prefer a simple delight or an extravagant sensation for the senses, your experience becomes an expression of life and Paris offers to indulge your desires. And now I have a desire to share a few simple and a very fine treat with you! I want to try Korean food… Yet I’m scared. I grew up on french and Irish food and some Italian but mostly french since my great grandma came over from Paris. I use to speak fluent french and sadly after she passed I forgot so much. She would cook for an army. I feel the same way about my own mother and how she took her language and knowledge of Korean food with her. Somewhere along the way I hope to give away one of the Korean cookbooks I am trying out! Thank you! I am so happy to hear that I am not the only one to have discovered the delights of Le Circus!